Allergic conjunctivitis affects approximately 20% of the world population. Around 98% of the affected population suffers either from seasonal allergic conjunctivitis or perennial allergic conjunctivitis. 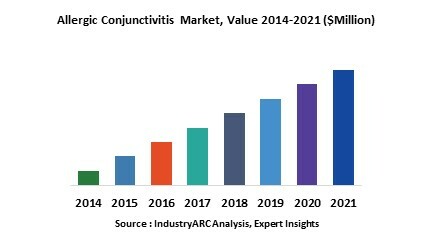 North America is dominating the Allergic Conjunctivitis Market and holds largest market share, followed by Europe and Asia-Pacific. The prevalence of allergic conjunctivitis is due to increase in the use of chemicals and pollution resulting from urbanization, industrialization and climate change. The increase in awareness of allergic conjunctivitis and its associated medical treatment is one of the factor driving the market. Allergic conjunctivitis is an eye inflammation caused by an allergic reaction due to allergens like pollen or mold spores, dust mites and animal fur. The eyeball has a membrane called conjunctiva which is susceptible to irritation from allergens. Allergic conjunctivitis is the body’s reaction to substances which are potentially harmful. There are different types of allergic conjunctivitis such as seasonal allergic conjunctivitis, perennial allergic conjunctivitis, giant papillary conjunctivitis, vernal kerato conjunctivitis and atopic kerato conjunctivitis. Some of the symptoms of allergic conjunctivitis are red, itchy, watery and burning eyes. Allergic conjunctivitis can be treated by oral medications, eye drops or immunotherapy. Ophthalmic companies are manufacturing new classes of drugs that target inflammatory pathways or mediators involved in allergic responses during the early and late phases. These drugs are being screened in the animal models which will further aid in identifying the next generation of anti-allergic therapy. Cellular therapy of the corneal stroma is gaining a wide range of interest in the past few years. Researchers along with the pharmaceutical companies are using adipose-derived adult stem cell transplantation in the corneal stroma. These cells have the ability to survive in vivo and produce new collagen which could potentially help remodel and strengthen the cornea in patients with keratoconus. Who are the Major Players in Allergic Conjunctivitis? The companies referred in the market research report are Aciex Therapeutics, Alcon/Novartis, Sun Pharma Advanced Research Company Ocular Therapeutix, Sirion Therapeutics, Boehringer Ingelheim and others.